Beef tenderloin and filet mignon are both well-regarded among steak fans. They are a couple of the more popular options on the menus of many upscale restaurants; however, you may have some trouble choosing between them unless you have a lot of experience shopping for steaks. The following look at how beef tenderloin and filet mignon compare to each other can help. Let’s dive into another BBQ Showdown to define the differences between the two. 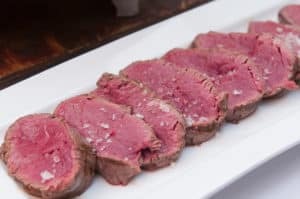 How do beef tenderloin and filet mignon differ? Beef tenderloin and filet mignon are two cuts of beef that cause a significant amount of confusion. Beef tenderloin is often labeled as filet mignon despite the fact it has different qualities. As the name indicates, beef tenderloin is particularly tender cut of beef. In fact, it is the most tender meat that a cow’s carcass has to offer. Beef tenderloin refers to a whole muscle that includes the filet mignon cut. The reason for the confusion is simple: true filet mignon’s conical shape does not lend itself to an attractive presentation since medallions cut from it are asymmetrical. Some of the medallions will be smaller than others. The tenderloin has a more consistent shape that makes it look better and it is almost as tender, but it is not true filet mignon. Where on the animal are beef tenderloin and filet mignon sourced? There are two tenderloins running down both sides of the cow’s spine, at the back of the rib cage and tapering to a point. The muscle’s tenderness results from the fact that it bears no weight and so does not get tough the way well-exercised muscles do. The end of the muscle towards the animal’s head and closest to the ribs is narrower. It is this part of the tenderloin that provides the filet mignon. The fact that it narrows to a point accounts for the conical shape of the cut. The center part of the beef tenderloin is used for chateaubriand and the thicker end portion used for tournedos. Is one easier to grill than the other? Trimmed beef tenderloin is low in fat and so is filet mignon. The leanness makes grilling easier as there is little fat to melt and cause flare-ups. With fatty cuts, there is always the risk of that fat causing coals to flare up and char the meat. While there is a reduced risk of charring, there is an increased risk of overcooking. Note also that fat insulates, it does not conduct heat. This means that a low-fat cut will cook in much less time than a cut with more fat. The smaller filet mignon will cook in even less time than beef tenderloin. You can easily wind up with meat that is too well done and dry as a result. Grill both beef tenderloin and filet mignon at a high heat and serve at medium or rare. Is one more expensive than the other? Both beef tenderloin and filet mignon are expensive cuts of meat. Filet mignon is considered the better cut of beef, which means that it comes with a slightly higher price tag. When should you choose beef tenderloin and when should you use filet mignon? Since both beef tenderloin and filet mignon are low in fat, they are typically low in flavor as well when compared to other steaks. Both are ideal options if you are not a fan of the rich beef flavor you might get from more marbled cuts like ribeye. Use beef tenderloin when serving more people as its lower cost will make feeding multiple guests easier on your wallet. 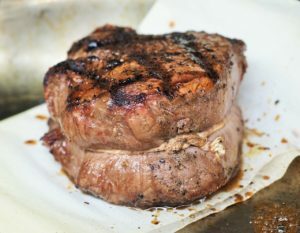 Opt for filet mignon if you know how to manage heat on your grill and need something that cooks quickly.